MP&C are you talking the part that the lens and chrome bolts too that more or less 2 90 degree bends with the 4 holes drilled in it? I just want to make sure that Im following you right?.If so I did similar to what you described. I made the outside of the housing then bent the inner pocket part. I didnt leave a flange though. I did a corner weld right where the inner and outer pieces meet. The parts are close by and granted Im no where near this level. When I saw Per make the mustang headlight pieces I quickly looked at mine and was like no where near as smooth and don't want to rely so heavily on body filler. The part that really messes me up is how to work so many small parts to get the contours right. At the time I didn't own a plannishing hammer. Its a mittler brothers and not a rams head or CP or anything of lore that you guys own. 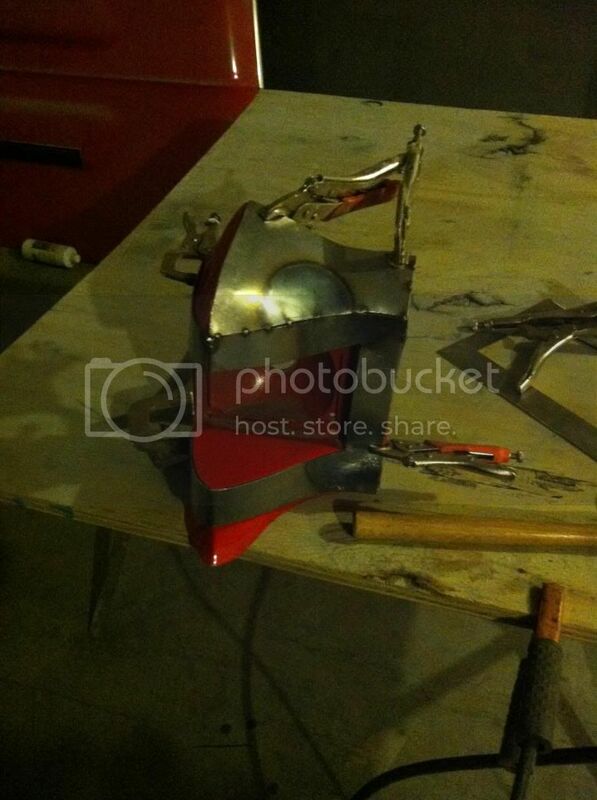 Dan suggested that this would be a good tool to utilize for this to help smooth and tweak the parts. I just feel that starting over vs fixing what I have is the best option. Esp since the welds were mig and will crack out and I do own a tig welder now. This shows what I mean by the outer and the inner wasnt made yet for this pic. Last edited by Kidpaint; 03-27-2017 at 04:37 PM. I am bringing my wife Jolene and camper this year. I am excited for her to meet everyone!! I don't have a project yet but if I do bring something it will be small. Planning to attend Fri & Sat; maybe Thu. As usual every year many folks from different media groups have contacted me and we will be having a very active group again this year. Stan Fulton will be here demonstrating his new Power Hammer along with all the many folks that have offered to do demonstrations. Something for everyone to experience Dagger Tools will also be here selling tools that cater to our trade. Todd Landon will be heading up a gas welding Aluminum area for all to experience the advantages of over Tig . There aught to be a like button. You sure do it up right Dapper Dan. Trying to hold my schedule open for Thu-Fri. Gremlins are at work though. Looking forward to it.